Orchards are a wonderful example of our cultural landscape and creating one must be one of the most worthwhile and rewarding activities. 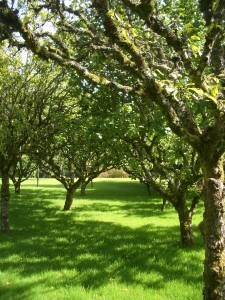 Creating a community orchard adds an extra dimension. As with community gardens we need places where people can relax, socialise, play, enthuse others and share. We need places where people can be closer to nature and appreciate the way it feeds us. This is a good enough reason to plant an orchard but orchards also trap carbon, reduce food miles, provide healthy food, reinforce local distinctiveness, maintain local varieties of fruit, provide good habitat for wildlife AND add beauty to our lives. Creating and maintaininng an orchard is a long term commitment and hard work and anyone wishing to start one deserves all the help they can get. Councils, businesses, developers, charities and local communities can all play a part in recreating a more sustainable, rich and beautiful landscape and help each other to improve our surroundings. Orchard design, particularly for community spaces takes into consideration many of the things which relate to community garden design and planning ( Mindmap of Community Growing Spaces – Planning Considerations “Mindmap of Community Growing Spaces – Design Considerations” ) however fruit and nut trees have their own characteristics, needs and problems – understanding these will aid the design process, the creation of a healthy orchard and its future maintenance ( Mindmap of Orchards – Design Considerations.) In addition because the purpose of a non-commercial orchard is about more than the production of fruit we have more of an opportunity to think creatively and imaginatively about the space. Every site is different and some sites will suit some species, varieties, rootstocks and pruning regimes better than others. By designing with knowledge and imagination and organising a management plan that fits the orchard’s long term requirements Verdant Earth can help to create an orchard that is beautiful, bountiful and natural. Fruit trees require pruning especially in the first few years of their life. There are plenty of books describing this however your tree is unlikely to look like the perfect tree drawn in the pruning guides. I have run several workshops on pruning and below are some guideline sheets to do with the workshop, they are therefore not completely self explanatory but should help.